Alyson Dixon, who goes fourth on all-time UK rankings list. The Boston, renowned for its hills, took its toll on the 40-year-old when she slowed over the second half of the race after going through halfway in 1.14.20. Saying that it was the hardest marathon that she had ever done, she finished in a time of 2.35.43, compared to her best of 2.29.06 from 2017. She finished second Over-40 behind Kate Landau of the US, who finished 13th in 2.31.56. The race winner was Worknesh Degefa, of Ethiopia, with a time of 2.23.31. Dixon’s performance gives her fourth place on the British all-time Over-40 Marathon list. Ahead of her are Priscilla Welch (Ranelagh) with 2.26.51 from 1981, Joyce Smith (Shaftesbury Barnet) 2.29.43 – 1982 and Emma Stepto (Cornwall) 2.32.40 – 2014. Kevin Jeffress, Sunderland’s first finisher in last year’s London Marathon, has pulled out of next week’s race. He has been suffering from an Achilles’ tendon issue and has been forced to take some time off. He said: “I decided to defer London a few weeks ago as I was training well, but my head wasn’t in it. I kind of lost my racing mojo a bit, so I’m just trying to get back into it. Sunderland Harrier Michael Edwards won his first race on Sunday since his victory in the Tanfield Harrier League race in 2015. He was the victor of the Chase the Kite Trail 10km race at Derwent Country Park, clocking 38.29 for the distance. John Donneky, of Derwentside, was runner-up (38.44). Houghton Harriers placed Dave Gribben sixth (43.40), and Shaun McGrath finished 13th (45.52), Sunderland Stroller Steven Finnie finished 16th (46.23) and Neil Cummings of Washington Running Club took 22nd (47.51). The Elswick Harriers’ Good Friday Road Relays has received a massive record –breaking entry. Around 1,200 athletes are expected to contest the five events on the programme. The Senior Men and Women, plus Veteran relays have received 140 team entries. The men compete over four legs and women over three legs. Also on the programme are events for young athletes and 270 entries have been received for these races. Sunderland Harriers are among the record numbers by having a good entry for the traditional races. Six women’s teams made up of three veterans and three seniors, plus four senior men’s and five veterans teams are down to compete. The Senior Men’s team has a new look about it with two of the runners making their relay debut. They are Liam Taylor, the winner of the Sand Dancer 10km on Sunday and Calum Thom the runner-up in the Dark Skies Marathon at Kielder. Club captain Nathan Reed, back on form after injury, and Craig Gunn, who will be out to beat his time of last year (11.41), complete the squad. The Women’s A team is expected to be Amy Callaghan, Eve Quinn and Sarah Knight, while Vicky Haswell, Judith Thirlwell, and Colleen Compson, make up the Veterans team. Race 1: 9.15am Combined Under-11 Boys and Girls race.1.6 miles. Race 2: 9.25am Combined Under-13 Boys and Girls race 1.6 miles Race 3: 9.35am. Combined Under-15 Boys and Girls race 1.6 miles. Junior presentations is from 10.20am at event HQ. Races 1, 2 & 3: The 1st 3 individuals for each gender & a 1st team award for each gender (3 to count). Race 4: 9.45am - Senior and Veteran Women’s Relays. 2.2 miles. Race 5: 10.55am - Senior and Veteran Men’s Relays. 2.2 miles. Event HQ at Cafe: Gateway House, West Newburn, Riverside, Newcastle NE15 8NX. HQ to the start line - 200m - Opens at 8.15am. 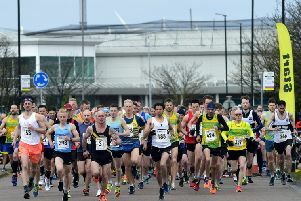 A field of around 2,200 will contest the North Tyneside 10k on Sunday (10am). It is said to be one of the most scenic running events in the UK - the route takes in a working Fish Quay, the River Tyne, English Heritage property Tynemouth Priory and Castle and a long stretch of coastline before finishing at St Mary’s Lighthouse, in Whitley Bay.